Research has shown that adding bevacizumab (Avastin) to standard chemotherapy can increase the overall survival of mesothelioma patients. The standard of care for mesothelioma is currently chemotherapy with pemetrexed (Alimta) and cisplatin (Platinol). 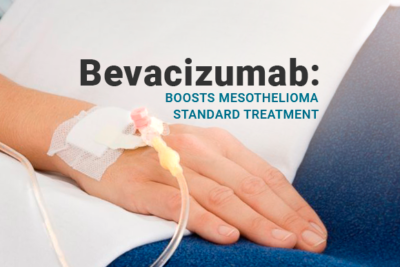 Bevacizumab is a helpful addition to standard chemotherapy for mesothelioma. The combination of pemetrexed, cisplatin, and bevacizumab is now listed in the National Comprehensive Cancer Network guidelines as a first line mesothelioma treatment option for certain patients. Why Add Bevacizumab to the Standard of Care? The Food and Drug Administration (FDA) approved approved Alimta and cisplatin as a pleural mesothelioma treatment in 2004. Since then, these 2 chemotherapy drugs have been the standard of care for mesothelioma. Standard chemotherapy has a response rate of about 40%. Many patients do not benefit from treatment with chemotherapy alone. It has now been 13 years since any changes were made to the standard of care. 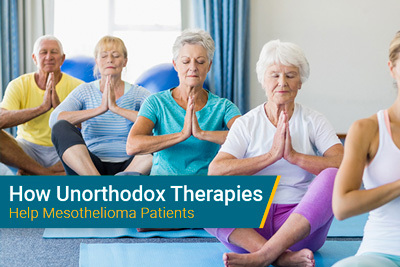 Researchers continue to develop new treatment options because many patients do not respond to mesothelioma chemotherapy. One option is adding bevacizumab to the standard of care. In one study, adding bevacizumab to standard chemotherapy increased median progression free survival by almost 2 months and median overall survival by over 2.5 months. Bevacizumab treats mesothelioma by blocking tumors from creating new blood vessels. The process of forming and maintaining new blood vessels is called angiogenesis. Mesothelioma tumors create new blood vessels in order to grow and spread. In a study on mice, researchers discovered that angiogenesis was one of the earliest events in the development of mesothelioma. Bevacizumab inhibits angiogenesis by blocking a protein called vascular endothelial growth factor (VEGF). VEGF helps tumors create blood vessels to spread further in the body. Researchers also believe VEGF increases cancer cell proliferation in mesothelioma. By blocking VEGF, bevacizumab may be able to control mesothelioma growth. Bevacizumab was tested with chemotherapy in a French clinical trial and proven to be effective at extending survival rates. This trial enrolled patients between 2008 and 2014. In that time, 448 mesothelioma patients were randomly assigned into two groups. One group received standard chemotherapy with pemetrexed and cisplatin while the other group received standard chemotherapy plus bevacizumab. Patients in the group that received just chemotherapy had a median progression free survival of 7.3 months. Patients who received bevacizumab as well had a median progression free survival of 9.2 months. Overall survival for the chemotherapy group was 16.1 months, for the bevacizumab group it was 18.8 months. Adding bevacizumab to the standard of care for mesothelioma was able to increase survival but also increased side effects. Researchers expected there to be an increase in side effects once an additional drug was added to the combination. Fortunately, these side effects are manageable. Talk with your doctor if you believe you would benefit from receiving bevacizumab along with standard chemotherapy. 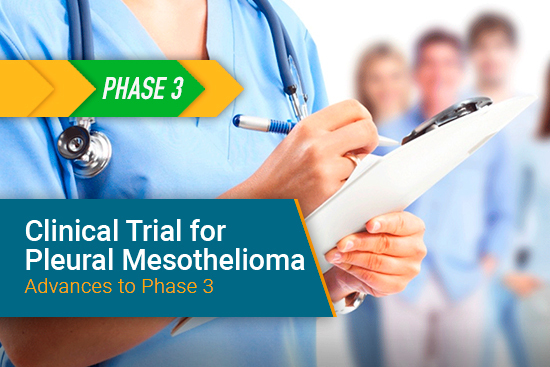 You may need to join a recruiting mesothelioma trial in order to access this treatment option. Spotlight on bevacizumab and its potential in the treatment of malignant pleural mesothelioma: the evidence to date. Dovepress. Retrieved from: https://www.dovepress.com/spotlight-on-bevacizumab-and-its-potential-in-the-treatment-of-maligna-peer-reviewed-fulltext-article-OTT. Accessed: 9/5/17. Bevacizumab for newly diagnosed pleural mesothelioma in the Mesothelioma Avastin Cisplatin Pemetrexed Study (MAPS): a randomised, controlled, open-label, phase 3 trial. The Lancet. Retrieved from: http://www.thelancet.com/journals/lancet/article/PIIS0140-6736(15)01238-6/abstract. Accessed: 9/5/17.